For the footballer, see Frank Simon. He is the first cousin of Kurt Mendelssohn. 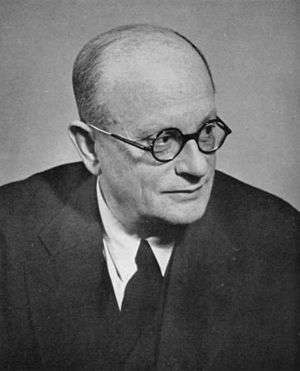 Sir Francis Simon, (2 July 1893 – 31 October 1956), was a German and later British physical chemist and physicist who devised the method, and confirmed its feasibility, of separating the isotope Uranium-235 and thus made a major contribution to the creation of the atomic bomb. He was born Franz Simon to a Jewish family in Berlin and won the Iron Cross First Class during World War I. He received his doctoral degree from the University of Berlin, working in the research group of Walther Nernst on low-temperature physics related to the Nernst Heat Theorem (Third law of thermodynamics). In 1931 he was appointed Professor of Physical Chemistry at Breslau. The rise of anti-Semitic fascism in Germany in the 1930s caused him and his wife to consider emigrating. Aware of his concerns Frederick Lindemann, 1st Viscount Cherwell met him in Walther Nernst's laboratory during Easter 1933, and invited him to join the Clarendon Laboratory at the University of Oxford. He was also able to offer him a two-year grant research from Imperial Chemical Industries (ICI) of ₤800. Simon resigned on 1 July 1933, but before he could leave an official demanded that he and his wife surrender their passports. Simon then flung his Iron Cross and other medals onto the table. Their passports were later returned, for reasons unknown. Using the services of a corrupt customs official Simon was able to take his research equipment with him. His wife and children followed him two months later. Upon arrival in the UK, he started using the Anglicised name "Francis". Using the equipment he had brought with him from Germany he performed pioneering work in low temperature physics. In 1936 he was able to produce the first liquid helium by using magnetic cooling at a laboratory at Bellevue near Paris. His ICI grant was extended to 1938 which allowed him to turn down an offer of a 10-year contract as Professor of Physical Chemistry at Istanbul. In 1936 despite being supported by Einstein, Nernst, Planck and Rutherford he was unsuccessful in beating Mark Oliphant for the Chair of Physics at Birmingham University. By 1936 his job security had improved when he was appointed reader in thermodynamics in 1936. Because he was naturalized, until 1940 he was prevented from working on radar. Because he was also on the list of people targeted for retribution by the Nazis his wife and children took up an offer to spend the war in Canada. Simon remained behind in Oxford. In 1940 in collaboration with Nicholas Kurti he was commissioned by the MAUD Committee to investigate the feasibility of separating uranium-235 by gaseous diffusion. He initially adapted his wife's wire kitchen strainer to assist in this work before commissioning a membrane from ICI containing 160,000 holes to the square inch. His resulting conclusions on the separation of uranium isotopes was transferred to the Manhattan Project and was the basis of the process that produced sufficient U235 to make the atomic bomb. He spent the latter part of the Second World War at Los Alamos, returning in 1945 to Oxford to continue his low temperature research. He became a professor at the University of Oxford and a Student of Christ Church, Oxford in 1945. Upon the retirement of Lord Cherwell he became Dr. Lee's Professor of Experimental Philosophy and head of the Clarendon Laboratory in 1956, one month before his death from coronary disease. He married Charlotte Münchhausen in 1922. They had two daughters, Kathrin and Dorothee. 1 2 3 4 Kurti, N. (1958). "Franz Eugen Simon 1893-1956". Biographical Memoirs of Fellows of the Royal Society. 4: 224. doi:10.1098/rsbm.1958.0020. JSTOR 769514. ↑ Medawar & Pyke. Page 81. ↑ Medawar & Pyke. Page 221. ↑ Medawar & Pyke. Page 80.